I don't know if seeing The Hobbit part 1 of 3 (teaser/trailer) in the much-discussed 48-frames-per-second diminished the viewing experience, but it certainly didn't help. Since it's the way Peter Jackson intended the film to be seen, it very much counts when judging the overall motion picture. It's neither the great savior of cinema that the likes of Peter Jackson or James Cameron would have you believe, but nor is it a bellwether of the 'death of cinema.' It is different, that's for sure. You get an unparalleled clarity of vision and a certain lifelike presentation, akin to looking at a window at 'real life.' The various CGI creatures look arguably more lifelike and the 3D is pretty flawless (although the screen looked even more vibrant when I took off the glasses, making me wish there had been a 48 fps 2D option). But for that clarity you lose a certain cinematic grandeur. Yes, certain introductory scenes look like live theater and yes, there is an inconsistency of speed, as any number of moments will make one wonder if they're watching the film on 1.5x speed on their Playstation 3. Moreover, even the action sequences, a few of which are indeed still impressive, resemble not so much epic struggles but rather watching a staged recreation akin to Civil War reenactors. Especially during battle scenes set in open fields, it feels more like the finale of Role Models than a tent-pole action sequence. Ironically, it's a technology that may actually be better suited to character dramas that big-scale action. Your eyes do indeed adjust to the whole 'speed play' issue pretty quickly, but you never do become 'used' to the effect during the entire 165-minute running time. This first film, shamefully bloated and lacking in any justification for its padding, plays less like a theatrical cut, or even like an extended edition DVD version, and more like an assembly edit, with everything tossed in and nothing pruned. Yes, I know Jackson is adding additional material from the Appendices and elsewhere, but the end result is a bloated and often quite-dull would-be adventure that has little of the wide-eyed wonder and emotional pull of the original trilogy. The irony is, much of the extra material seems intended to better tie this new trilogy into the prior one. Say what you will about the Star Wars prequels, but they stand on their own. The Hobbit: An Unexpected Journey uses the prior trilogy and our fond memories of it as an emotional cheat. As someone who found the prior trilogy incredibly moving, the only emotion I felt this time around were the moments where Jackson and composer Howard Shore use the original themes, that music being so powerful that I found myself caring despite myself. Imagine if Star Wars prequels used the 'Force Theme' every time Lucas wanted to get a lump in your throat and you get the general idea. Absent its connection to the prior films, this new story is shockingly unengaging, forcing a sense of urgency and greater peril where none really exists. And one cannot help but notice how Jackson structures this new picture so that it feels like a variation on Fellowship of the Ring in terms of pacing and plot beats even while attempting to tell a different story. Absent the genuine and clearly-established stakes of the prior picture and lacking worthwhile characters, it's an odd fit, akin to fitting a square peg into a round hole. One wonders what could have been if Jackson and company had just focused on I dunno, making The Hobbit as opposed to Lord of the Rings: Episode One: An Unexpected Journey. 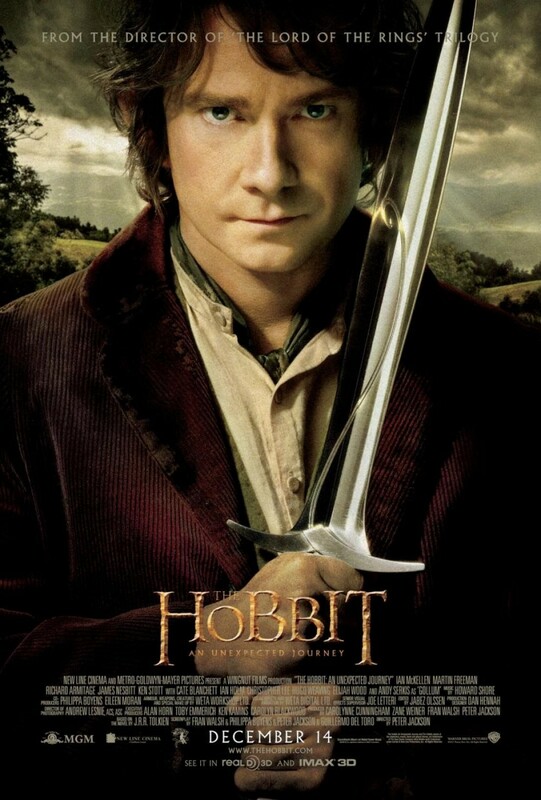 The film is certainly well acted, although the only dwarf who stands out is the noble Thorin (Richard Armitage). If I point out that the film strains to turn Thorin into Aragorn 2.0, then I will also point out that the film doesn't try to otherwise copy the fellowship from 11 years ago. Martin Freeman makes a fine Bilbo Baggins, even if I question the rather simplistic 'he proves his worth by killing stuff' character arc. The major returning character is of course Gandalf, and it's clear that Ian McKellen is glad to be back, even if he has far less to do this time around. I was rather amused by a sequence around halfway through the film which becomes an unofficial class reunion from Fellowship of the Ring. For no other reason than to have Gandalf ominously tease the future events from the prior films, we get an extended chit-chat between Gandalf, Elrond (Hugo Weaving), Galadriel (Cate Blanchett), and Saruman (Christopher Lee), which plays not unlike the equally pointless/gratuitous conversation between Stallone, Schwarzenegger and Willis in the first Expendables. We do get to see Ian Holm and even Elijah Wood right at the start, but said introductory scene serves only to remind us how much better Fellowship of the Ring was. Although it could be argued that said intro exists merely to get your eyes adjusted to the 48 fps before the actual new story kicks into gear. The action sequences are still pretty impressive, no matter how weirdly lifelike they now look in 48 fps. I'd be lying if I didn't say that the last 45 minutes somewhat kicks back into gear, with an extended cameo from Gollum (Andy Serkis, brilliant as always) and a rather superb escape sequence set in an underground environment full of rickety bridges and bottomless gorges. During these moments, as well as a pointless but visually astonishing sequence involving rock monsters, one can't help but get a bit of the old-time religion back in ye bones, even as you ask yourself what the proceeding two hours was about. It's not about character development, as we have little more attachment to the many dwarves at the end of the picture than we did at the start. The film is arguably intended to be more kid-friendly, with somewhat simplistic character arcs and rather spelled-out ideas, but it still contains enough gruesome violence and scary moments to almost qualify as an "R-13" just as the original trilogy did (there is a contrived 'arch foe' that is not only scary looking but has a spear sticking out of both side of his arm). If I were optimistic, I'd say that Jackson got most of the 'random dwarfs annoy Bilbo and sing to themselves' material out of the way now, leaving the last two films full of epic adventure and character-driven payoff. At the conclusion of The Fellowship of the Ring, I was completely on board for the next two pictures, completely invested in the world that had unfolded over the previous 170 minutes. This time around? I'm not entirely sure whether I'll stick it out for the next two films. The Hobbit: An Unexpected Journey not only betrays our love of the original trilogy but also those fans like me who defended the painfully underrated King Kong. It's certainly not as good as the original trilogy, nor any of the six Star Wars films or the eight Harry Potter films. But neither is it anywhere near as unsatisfying as the likes of Percy Jackson and the Olympians: The Lightning Thief, existing somewhere in the forgettable middle ground of the last Narnia picture. It is obvious that Peter Jackson, at least in this case, desperately needed someone to tell him 'no.' "No" to including every bit of Tolkein material he could in what turned out to be three films. "No" to painfully attempting to tie in The Hobbit to the Lord of the Rings films rather than letting The Hobbit be its own adventure in the same world (in terms of structure and plotting, The Hobbit comes off as a quasi-remake of Fellowship of the Ring). "No" to shooting on 48 fps until the technology had advanced to the point where it would make his adventure feel more cinematic instead of less so. Perhaps, I'd argue "No" to returning to Middle Earth at all, as it's arguably even clearer now that he came back because he felt he had nowhere left to go after the artistic failure of The Lovely Bones, as well as the inexplicable retroactive perception that King Kong was an artistic and financial failure (wrong on both counts). Movies The Hobbit Ian Mckellen Martin Freeman Warner Bros.